Get a quote from the log home repair professionals! 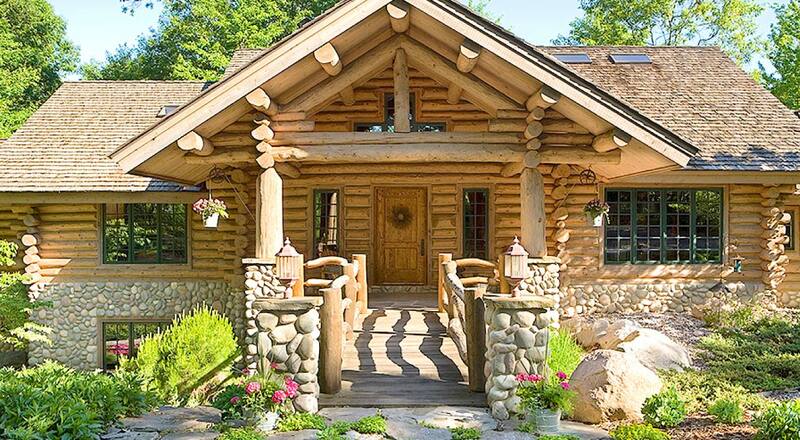 Are you seeking help for your log home repair project? You've come to the right place! We've been helping log home owners with log home restoration and log cabin repair services for over 31 years! If you are looking for a log home restoration company to provide professional help, quality craftsmanship, and exceptional log home repair services, you have come to the right place. Please browse around our website for in depth information about log home restoration. Feel free to call or email us with any questions or to get started with your log home restoration project. We're here to help restore your log home! We had let the finish on our log cabin get away from us & were looking for someone professional to do the job for us. We checked several companys & there was only one that stood out above the rest. Mike from M&M Log Home Care was very informative, always returned phone calls & did everything he promised to do. He also was very patient & didn't mind that we checked other companys to be sure we were doing the right thing. All his references praised his work & I am happy to be among them. When they arrived, (Scott, Kirk, Mike) they were well organized, ready to work and stayed with it til the job was done. They were very neat, very friendly & we were impressed with the finished project. they even had their own porti potty. Mike takes the time to figure out what will work best for your project & had an answer for all of our questions. I would recommend you choose this company. You will not regret it. Also he gave me ample color samples so I could choose the best one. Ryan, Thank you for the quality work and friendly service of American Log Restoration, Inc. Mike and Dan are skilled craftsmen, working long, hard hours to restore our cabin home. American Log Restoration, Inc. is very fortunate to have these dedicated professionals representing the company! Mike, I would like to say that Brian, Kirk and Josh did an excellent job corn blasting, staining and chinking my house. I have received numerous compliments on how good it looks. All I told them when they first got here was that I just want the house to look as good as the new truck I could have bought. It does! They were very easy to talk to especially when we talked about hunting. They were very consentaneous and their workmanship represents your company well. I am very grateful to both Mike and Ryan at M&M Log Home Care and American Log Restoration for their expert assistance in preserving our log home. They listened carefully to our particular needs and concerns and offered solutions that were proper for our situation (we had unique requirements compared to many other log home owners). They were very thorough in explaining how the work would be performed and exactly what to expect during the process. When other companies were reluctant to speak to us or help point us in the right direction, Mike and Ryan came through. They have extensive experience in log home care and restoration which was evident during our discussions. They were professional, caring, and thorough. I highly recommend M&M Log Home Care and American Log Restoration for any of your log cabin needs. I just wanted to let you know the workers did an excellent job and the house looks super. You can tell them they left a garden rake here, now I know they will be returning later! I hope you can give me an estimate regarding the chinking of the end logs outside and the corners and purlins and fireplace inside. I really want to do that if it is financially feasible and you can schedule it this year. Mike mentioned half logging the garage and I believe he will also give you some measurements on that, but I have not really decided yet that is in my budget. Thanks again for all your help, and tell the guys how much I appreciate their good work, I hope I didn't give them too hard a time! If I don't hear from you in a couple of weeks I may bug you again. My internet service will be out for a few days, but will be up and running again soon.